Twas the same snowy morning, and two forlorn clementines were staring at me, beseeching me to do something with them other than throw them away. They were already several days past their prime, shriveled and sunken, although not yet spoiling. There must be something I can do with them, I thought. 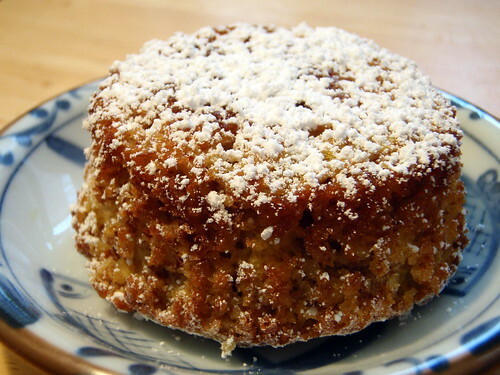 And then I remembered the clementine cake recipe I had noticed on Smitten Kitchen. 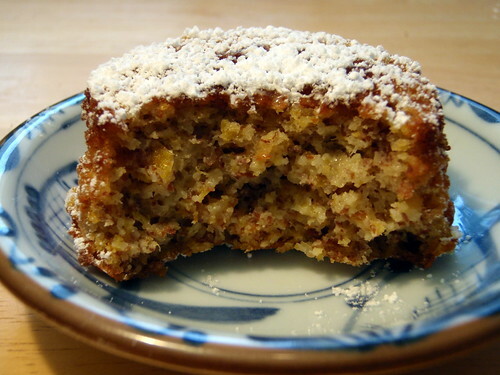 A flourless cake made with whole clementines, almond flour, sugar, and eggs. Perfect, because I had some leftover almond flour from the macaron experiments that I needed to use up. Alas, two clementines do not a whole cake make. So then I thought, why don't I try cupcakes? Since it was snowing, and I didn't have any ice in the freezer, I figured I'd try cooling the clementines outside in a snow bath instead of an ice bath. 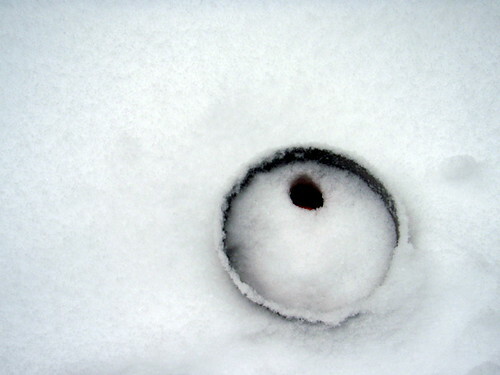 I put a metal bowl out, and an hour and 15 minutes later, it was halfway full of snow. 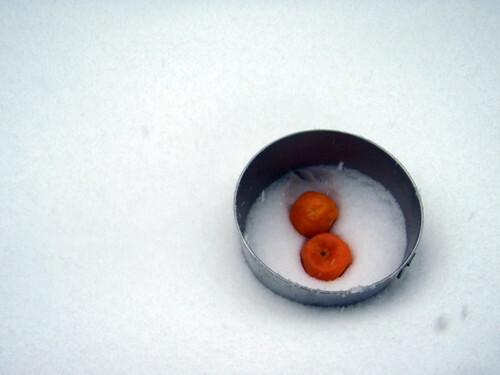 I plopped the two clementines in there and covered it with more snow and waited half an hour. When I looked back on it, this is what I found. One of the clementines melted its own little chimney! 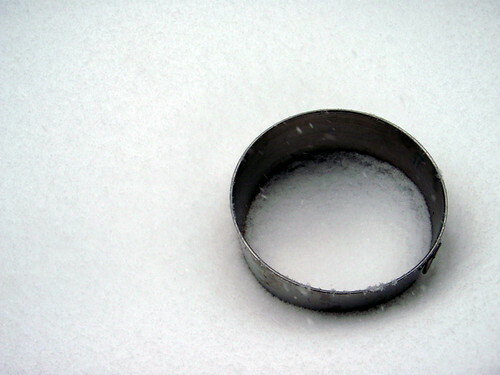 If you don't happen to make this on a snowy day, go ahead and just use an ice bath or even a cold water bath. The clementines don't need to be chilled, just cool enough to cut in half and not worry about getting boiling clementine juice on your fingers. 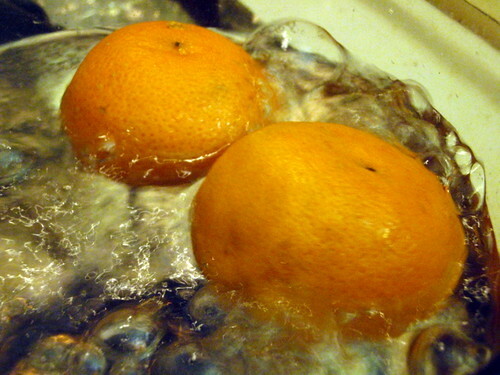 Put the clementines in a pot with cold water to cover, bring to the boil, and cook for 2 hours. 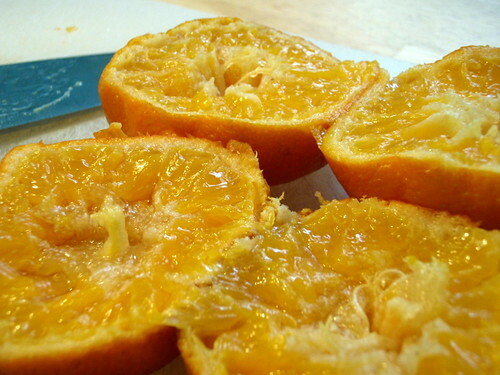 Drain and, when cool, cut each clementine in half and remove the seeds. Then finely chop the skins, pith, and fruit. Line a cupcake pan with 8 cupcake liners. Beat the eggs. 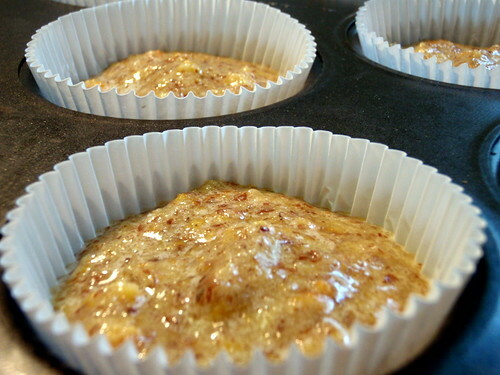 Add the sugar, almonds, and baking powder. Mix well, adding the chopped clementines. Pour the cake mixture into the cupcake liners, about 3/4 full, and bake for 30 minutes, when a skewer will come out clean. Remove from the oven and cool. Remove the cupcake from the liner, turn upside down, and dust with powdered sugar. Serve at room temperature. I was a little afraid that the clementines were too old to use, but boiling them in water for two hours really rehydrated them into their young, plump selves. I filled the liners to about 3/4 full but these cupcakes barely rose so you can probably fill them higher if you want. The cupcakes break easily when you remove them from the liner, so you can just dust them while they're still in their liners and serve them that way, but I like the look of the individual mini-cakes. What a great idea. I have a whole case of clementines sitting around because they just didn't peel very easily and were a pain to eat. Every time I looked at them, I thought, what am I going to do with those?? Now I know! I love it!!! How creative! 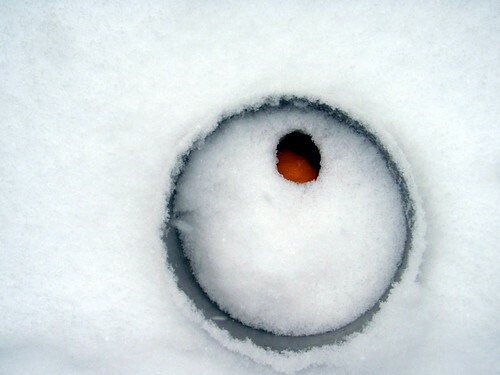 I love the picture of the clementines sitting in the snow.